We’re in the paper this morning. I’m still miserable about this. We used to hear bird song from our bedroom but that is no more. All we can hear now is the heavy machinery on the street. I spoke to one of my neighbour’s this morning who said she cried all day yesterday too. She similarly cried two years ago when they removed the trees from across the road. She said the council also tried to remove a tree from her own backyard for no good reason but they were able to fight against that because it was on their property. As always I find comfort in writing and I wrote in chalk on the road this morning. Healthy trees felled by ACC. I approach my whole life in such a way as to reduce my environmental impact. I don’t own a car, I don’t eat meat or dairy products, I only fly when there’s no alternative and most of our holidays are local, I also cycle and walk everywhere. The City Council tell me they can’t afford to make it safe for me and my children to cycle around the city. Instead we have to dodge cars, trucks, and buses. And yet they have the money to remove healthy, mature trees and replace the entire footpath at great expense. Sometimes I wonder why I bother? Posted in Journal and tagged Aberdeen City Council, birds, dismay, SAD, trees. Bookmark the permalink. 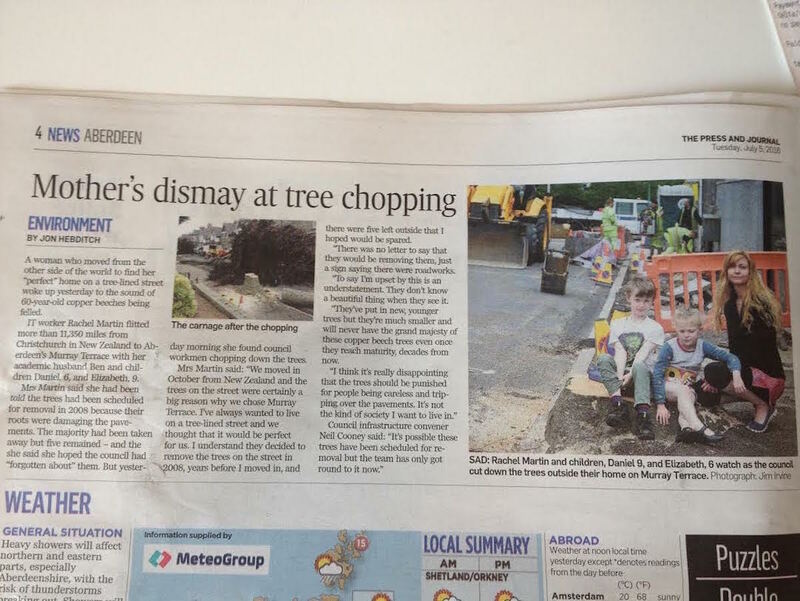 It is very sad that the Council couldn’t find an alternative to chopping down the trees. What a shame that people are so litigious. I had heard rumours about the council here and their wasteful and destructive spending. Now I see it for myself. I love your spirit. Don’t despair. Keep fighting. We all need to keep fighting to change this insanity. I sympathise and appreciate your effort. I’m a landscape architect that worked for local government many years. I had regular battles with the public works people over street trees. There is a mindset out there that just doesn’t see the benefit of trees. When a tree buckles a sidewalk, they see lawsuits. A nearby community, Alexandria Virginia, is dominated by people guarding history. That history includes its’ trees. There are 200 year old beautiful trees buckling sidewalks everywhere yet the public works there has developed methods of first saying the tree stays, then second, how can we manage the sidewalk around it without damaging the tree. They do a great job and the community is a leader in the area for having a thriving economy with happy citizens eager to live there under the canopy of beautiful trees. Sadly that is not the case in most communities. It’s heart-warming to hear about the Alexandria Virginia community. Do you know what they do to protect the pavements? I’m sure there must be alternatives with a bit of thought and ingenuity. Kia kaha and best wishes, Rachel. It has been a while since I heard someone say kia kaha. Thank you. It means a lot. I’m so sorry. I know that you miss the birdsong. It’s good that you spoke up even though you couldn’t stop it. Some thoughts (I’ve been away from blogging for a couple of weeks and it’s difficult to know which of your tree posts to reply to). First, I know birds, They will be back. They are very adaptable creatures. If there’s no tree to nest in, they’ll find eaves, hedges, shrubs, all sorts. They are more resourceful than we humans. And you will hear them sing again as soon as the machinery has gone: they don’t like that. Put some food out for them when the workmen have gone – some suet or some soaked raisins or some broken peanuts or sunflower hearts. They’ll find you. Oh and, they need to look after their own interests first which at this time of the year means finishing off feeding and caring for their young (which will have fledged by now) and then all those birds will seem to vanish for a while – that’s when the young are dispersing to find their own territories, and the adults are hiding away while they moult ready for the end of summer. Like you, I adore trees and mourn their unnecessary destruction. That said, beautiful though they are, beeches – particularly copper beeches – really shouldn’t be in narrow urban streets. Their roots are too strong and too long. They’re pushing up the pavements because they want to be free of them: they belong in a field or a forest. Eventually they will also disturb the foundations of the houses and try to heave them out of the way, too. Left to their own devices they will reclaim the land we’ve stolen from them. It’s actually more unfair on the tree to have them there than not to have them there. Other types of trees are more suited to UK city streets and while they might not be as majestic are still beautiful living things. Many are faster-growing, too. As for local councils in the UK – they mostly can’t think beyond their wallets. And yes, they would like to avoid being sued, but it’s not just a matter of people being more careful as that assumes that everyone using the street is able-bodied. The elderly, the infirm, the physically handicapped, people with canes or crutches, zimmer frames or any other type of walking aid; people with sight problems (particulalry at night or in low light) and the blind, just to mention a few – none of these would be able to manouevre with ease through a street with a tree’s roots heaving itself out of the pavement. So… I understand it from your point of view, and the trees’ … but also can see it from a different angle. Thanks for your very kind and thoughtful comment, Val. I would understand and accept the removal of the trees if they were a threat to the foundations of the houses but as far as I’m aware this is not the case. The city council did not give this as a reason. I’m so cross about it because the only reason they gave me was the threat of legal action and this just isn’t good enough.